Shilo resident Tzvi Strook sentenced to a year and a half in prison for allegedly beating an Arab. He denies being at the scene at the time. Tzvi Strook, a resident of the Samaria community of Shilo, was sentenced on Monday to a year and a half in prison after he was convicted of beating an Arab on the outskirts of Shilo four years ago. 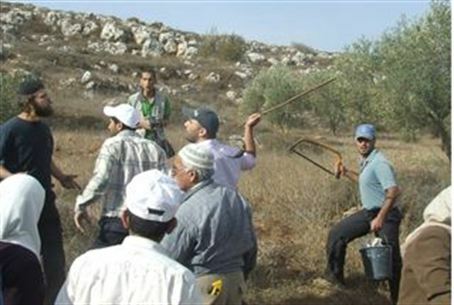 Strook’s indictment alleged that he, along with another man, beat a PA Arab shepherd and dragged him onto a tractor. The shepherd was injured and consequently lost consciousness, claims the indictment. Strook's conviction had been announced in November. In his ruling, Jerusalem District Court Judge Amnon Cohen expressed his shock at the severe bruises that were found on the body of the Arab boy. The judge ruled that the evidence presented about Strook’s character in his defense is inconsistent with his actions, and added that for this reason, a punishment that does not include imprisonment may not pass along the correct message about the severity of Strook’s actions. Strook was also ordered to compensate the Arab boy with a sum of fifty thousand shekels. Strook denied the accusations against him all along and said they were false. He said that the police work was sloppy and that the testimonies by the Arabs were contradictory, a fact that Judge Cohen noted in his verdict despite having ruled against Strook. Strook also said that Yesh Din, an extreme left-wing organization whose stated mission is “to oppose the continuing violation of Palestinian human rights in the Occupied Palestinian Territory” and which filed the charges against Strook, updated the various witnesses in the case on the contents of testimonies by other witnesses. Strook’s mother Orit, who heads the Judea and Samaria Human Rights Organization, responded to the verdict on Monday, telling Arutz Sheva that “Judge Amnon Cohen’s sentence gives victory to the false Arab witnesses who conduct a war against the Jewish farmers. The judge preferred to believe the main witness, who is a terrorist standing trial for throwing Molotov cocktails, over Tzviki Strook, a farmer with no previous criminal record, whom character witnesses noted is a delicate gentleman who is responsible and law-abiding.” She said that there is proof that her son was somewhere else at the time alleged for the beating.